In addition to his scientific interests, Josh has a wide variety of hobbies. He plays guitar and piano, and he is also an enthusiastic chef. Recently, Josh has gotten into rock climbing, and he is looking forward to his first major outdoor climb this summer. At work, Josh is a cell biologist, microscopist, faculty member, and a science author. He studies how cells work to better understand processes related to health and disease. In particular, he has done work looking at kidney disease, cancer, and the potential for nanomaterials to act as diagnostic and therapeutic agents. To answer questions about the structure and function of cells, Josh uses different types of microscopes, and he runs a microscope core facility at Northwestern University. The goal of the facility is to provide the imaging technology and expertise needed by different labs to help them conduct their research. Josh authored his first book this year, and it presents the history and important topics from the fields of molecular cell biology and microscopy in a format that is interesting for scientists and accessible for nonscientists. When Josh was a kid, he loved fishing and playing in the mud at his family home on Long Island. He was fascinated with the natural world, and particularly interested in the ocean. Josh was also inspired by his grandmother who received a degree in microbiology from the University of California, Berkeley in a time when few women attended college and even fewer pursued science. In college, Josh explored geology, oceanography, and environmental sciences, but his undergraduate research mentor also piqued his interest in physiology. Over the years since, Josh’s interests in science have evolved from studying physiology of whole organisms, to investigating physiology of single cells, to building microscopes, to managing a core facility where he educates other researchers on how to use microscopes to best answer their own research questions. In his lab at the University of Birmingham, their microscopes were connected to a computer containing all the necessary software to collect and save images electronically. There were many different file formats that could be selected for saving the images. For some software, there was a default file format set, while for others, it automatically suggested the most recent file format used. Some file formats included all the necessary metadata, while others were more like saving a screenshot of the image without any data. One of the master’s students working with Josh didn’t realize that the save prompt didn’t always default to the same file format, and she saved some of her images correctly, and some of them incorrectly. When she went to analyze the data, a portion of it didn’t make any sense because the data were missing. Josh was able to troubleshoot the issue, and luckily the student had kept her slides. She was able to go back and re-capture the images correctly, but it was a big learning experience for both of them. Josh is the primary investigator on an equipment grant that they recently submitted to the National Institutes of Health for a new microscope system. They just received notice last month that the grant will be funded. With the grant, they will purchase a cell culture incubator that includes a plate stacker, robotic arm, and a fully automated microscope. It will allow them to image thousands of separate samples in parallel using an automated system. This was a rewarding accomplishment personally for Josh, and he is also excited that the microscope system will immediately benefit the research of many groups there. Another fantastic success for Josh was helping a professor address feedback from a reviewer of one of their manuscripts. Josh suggested a superior technique that allowed them to collect the necessary data to re-submit the paper. It was immediately accepted, and Josh was delighted to be offered authorship on the paper for his substantial contribution. Josh traveled to the island of Crete to attend a scientific meeting there, and he had a fantastic experience. The seafood was delicious, he was able to swim in the warm waters of the Mediterranean Sea, and he visited the beautifully restored Etz Hayyim Synagogue during services for Rosh Hashanah. It was wonderful to learn about the history and restoration of the synagogue, and the people there were very welcoming. Travel isn’t the only way to expand your cultural horizons as a scientists since many labs include diverse groups of people from all over the world. When Josh was at Mount Sinai for his PhD, one of their collaborators from England would serve her mouth-watering, hand-made mince pies at an annual lab Christmas party. Every mince pie afterwards, including those Josh sampled while he lived in England, paled in comparison. Josh also remembers an Iranian student bringing in the most delicious pistachios from home, and he used to have chile pepper eating contests with some of his Indian and Pakistani colleagues. You can learn a lot about the natural world by measuring things. When you’re trying to repeat an experiment, it is critical to reduce the variance in your data by being as systematic and consistent as possible every time. Also, you’ll be happiest if you find something you love to do and find a way to do it for the rest of your life. There are a lot of different ways to have a science career. Try to be flexible as your interests or the available opportunities change. Josh received a bachelor’s degree in Biology from Brown University and then went on to earn a Ph.D. from the Program in Mechanisms of Disease and Therapeutics at the Mount Sinai School of Medicine Graduate School of Biological Sciences of New York University. Following defense of his thesis, Josh went on to perform postdoctoral work at The Rockefeller University in New York City in the Laboratory of Cellular Biophysics. Subsequently he was recruited as a tenured faculty member in the School of Biosciences at the University of Birmingham in England. 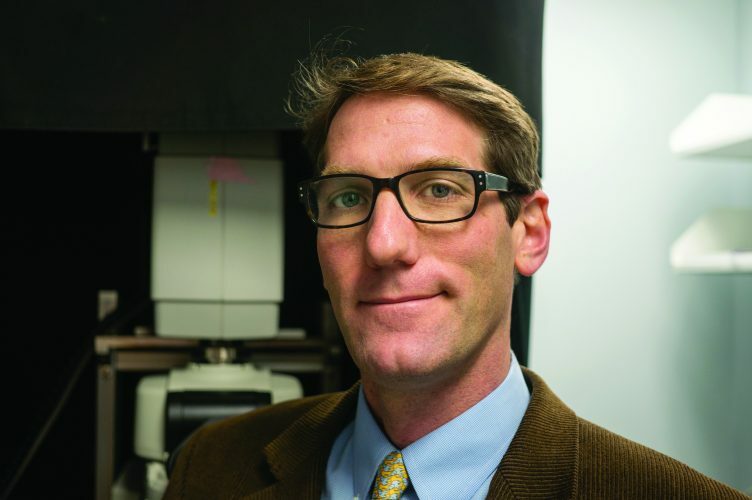 In 2014, Josh returned to the United States where he is currently the Director of the Center for Advanced Microscopy and Nikon Imaging Center at the Northwestern University Feinberg School of Medicine, and a faculty member in the Department of Molecular and Cell Biology. Josh’s scientific perspective aims to develop and apply cutting edge microscopy to address fundamental questions in cell biology. He lives in Chicago with his wife Ema (a neuroscientist) and their dog Kris.